A new market research study by Jon Peddie Research projects that Professional Monitor revenues will exceed 50 billion U.S. dollars (SAM) by 2018 at a CAGR of 37%. Market data is provided for the Global Professional Monitor Market 2018-2023. We have identified 20 companies offering professional desktop monitors, including broadcast reference monitors. Those companies offer1,312 monitors total, and of that list they offer 84 professional desktop monitor SKUs. The professional monitors, as per our definitions s from 1.9 M pixels to 33.2 M pixels resolution, with the average being 8 M pixels. 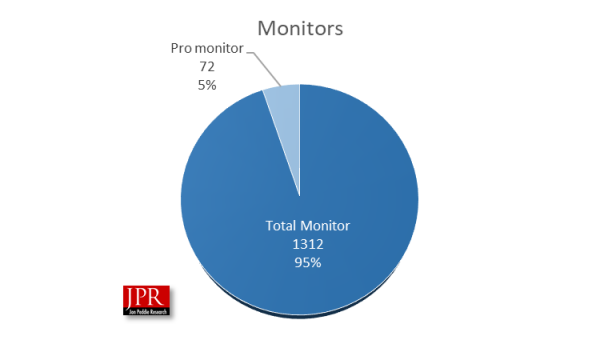 JPR estimates the number of users of professional monitors to be 35 million based on shipments. The Global Professional Monitor market 2018-2023 report delivers comprehensive information about the Professional Monitor industry including valuable facts and figures, important aspects, and skilled opinions providing businesses with decisive information. The report covers the global perspective and offers a precise outlook of the Professional Monitor industry. Furthermore, the Professional Monitor market report provides platform segment classification, their growth including segmentation and sub-segmentation and overall business strategy of the market. To request an excerpt of the report and TOC, contact Robert Dow robert@jonpeddie.com 415 435 9368. The Professional Monitor market report summarizes the most recent macro and micro-economic trends within the global Professional Monitor markets based on critical elements including technology, supplies, production, profit, price, and competition. The Professional Monitor report further provides a detailed analysis of the key business leaders and their current business environment and expected future developments within the Professional Monitor market. Professional Monitor market research report offers an overview of the global market on the basis of suppliers, partnerships and distribution, sourcing strategy and downstream buyers. The research report further features shares data about Professional Monitor market competition, manufacturers, effect factors together with market forecast (2018-2023) providing a deeper understanding of the competitive landscape and industry insights of the Professional Monitor market enabling one to make strategic decisions- accordingly. Key specifications (nits, HDR, etc.). Competitor analysis: The report provides a summary of the Professional Monitor key manufacturers with leading market share in the Professional Monitor market. This section further provides exhaustive competitor analysis based on shipments, restraining elements, revenue, variable Professional Monitor market changes, products, post-sale processes, and regulatory compliance. Market Attributes: Numerous attributes of Professional Monitor market such as growth and restraining factors, the technological advancements, new upcoming opportunities, and Emerging segments of the Professional Monitor industry are covered in this section. Trends: The trend section reveals the details about the emerging trends involved in Professional Monitor industry such as globalization and consolidation, Professional Monitor market fragmentation regulation & environmental concerns, technology advancement, over-capacity in developed markets, and product proliferation. Miscellaneous elements: The Miscellaneous elements in report emphasis on additional details such as Professional Monitor production capacity, price, demand, supply chain/logistics, profit/loss, material parameters/specifications, and the growth factor of the Professional Monitor market report. Other information: The report also identifies further useful and usable information about the Professional Monitor industry mainly includes Professional Monitor development trend analysis, investment return, and feasibility analysis. The report also includes four hours of consulting time for individual questions and opinion. JPR’s Professional Monitor Market Report is available now in electronic form and sells for $4,000. Included with this report is an Excel workbook with the data used to create the charts, the charts themselves, and supplemental information.